Chronic venous insufficiency is a very common medical problem. It affects over 30 million people in the United States alone. This makes it more common than coronary artery disease, peripheral arterial disease, and stroke combined. This however, is a very underdiagnosed and undertreated condition. It is estimated that only 10% of these 30 million individuals seek treatment. Venous insufficiency comes on gradually. Most commonly, the saphenous veins in the legs begin to dilate or enlarge. This pulls apart small valves in the veins that are designed to help blood flow back to the heart in a step wise fashion. 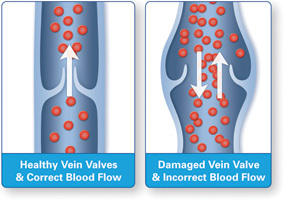 As these valves pull apart, the veins lose their ability to keep blood flowing upward. Pressure on these veins continues to build causing further dilation of the veins. This is classically seen as varicose veins on the surface of the skin. However, over half of our patients don’t have any varicose veins visible on the surface. Instead, their abnormal veins are underneath the skin and are only visualized under ultrasound. It is of great concern to us when patients experience a gradual decline in their mobility and exercise due to their symptoms from venous insufficiency. We know from research that if we are active, mobile, and exercise, that we are going to reduce hospital costs, lower risks of medical disease, and patients will have a better quality of life as well as a longer life. Our goal at Heart of Dixie Vein Center is to get our patients back to being as active and as mobile as possible, thereby reducing the costs of health care, and improving the quality of our patient’s lives. If any of you are suffering from the symptoms of venous insufficiency we recommend you call today for a consult with one of our providers on this common and treatable disease.